In a small bowl whisk together all of the ingredients for the aioli. Cover and refrigerate until you're ready to serve. In a medium bowl, combine the tuna, egg, yogurt, shallot, pepper, garlic, parsley, salt and pepper. Mix together with a fork until combined. Be careful not to over mix and break up the tuna too much. Form the tuna mixture into 4 cakes. 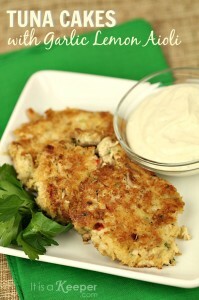 Place the the Panko on a plate and press each cake into the bread crumbs, coating both sides. Place the tuna cakes in the pan and cook for 3-5 minutes on each side, or until golden brown. Remove from pan and serve immediately with Garlic Lemon Aioli.